Time was when you’d whack the middle of the steering wheel and you’d hear a faint peeping from under the bonnet. These days wheels aren't made of Bakelite and horns have got a lot louder, but the horn button has typically migrated to the end of a stalk to make way for an airbag. Now it seems that carmakers have other ideas for this piece of automotive furniture that stares us in the face whenever we drive. Citroen caused a stir by making the centre of its steering wheel sit still. The large central boss of the wheel in the C4 is fixed, while the wheel and its spokes whirl around a hub hidden behind the boss. Why? According to the French firm, this arrangement allows the fitment of a better airbag. Since the orientation of the bag is known, it can be shaped and sized to more efficiently cradle your hurtling bonce during an impact. Basically, it doesn’t have to work when it’s been spun upside down. But if Toyota’s stand at the recent Geneva motor show is anything to go by, Citroen’s cleverness is just the start. Toyota clearly thinks the hub is a great place for putting driver information systems. 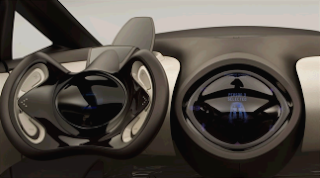 The Hybrid X concept car features three bits of user-interface real estate: one big screen in the centre console, one curvy console where the conventional instrument panel belongs, and a third information screen slap bang in the middle of the circular thing you steer with. 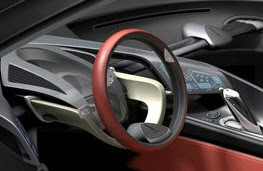 Meanwhile the FT-HS does away with the middle bit of the steering wheel altogether. Instead the rim of the wheel rotates while the spokes stay still (which kind of implies steer-by-wire – yelp). This allows a shaped airbag and a clear view of the instruments on the far side of the wheel. Now we may be thicker than a Hummer omelette, but is all this cleverness truly necessary? After all, unless you’ve got gibbon’s arms, the centre of the wheel tends to be comfortable sited when it’s well below the driver’s line of sight. Which means that the best place for up to the minute info isn’t way down in the wheel, but up there on top of the dash – even floating at the foot of the windscreen in head-up display format. Our money is on hubs staying put for the foreseeable future.